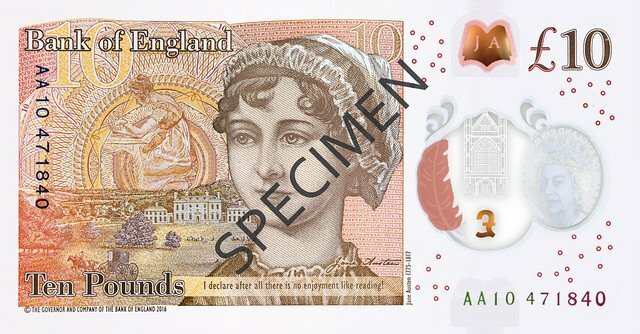 To mark the 200 year anniversary of Jane Austen's death, the Bank of England celebrates the nation's literary accomplishments through their latest banknote design. As an added bonus, the Royal Mint has carefully snuck into circulation a limited edition set of £2 coins embossed with her silhouette... starting with tills around Austen's old stomping grounds. Get hunting, coin collectors and Austen aficionados! The new £10 banknote. Provided by the Bank of England. Alas... with change, comes controversy. Some have toasted to the move towards equality, others have found the context of the Austen quote contradicting. That's because the quote is spoken by a character in Austen's Pride & Prejudice, as a blatant ploy to attract Mr Darcy. Some supporters believe it only adds to the impact of the quote because the author's recognisable social satire is inevitably discussed. The controversy doesn't end there. Animal rights activists and vegans have critiqued the use of tallow (animal fat) however small, while others have defended the resulting increase in durability which means the notes now last two and a half times longer than the previous series. What are your thoughts? Meanwhile, Scotland's own £10 note is also being replaced by a new, shiny and plastic note this autumn. Like Austen's note, the theme of literature is also prevalent in Scottish currency as the new note continues to feature the face of novelist and poet Sir Walter Scott. "The new note retains our much loved design of Sir Walter Scott with the famous Glenfinnan Viaduct pictured on the back and we've evolved the design by introducing the popular heritage tourist train crossing the bridge..."
The new Scottish banknote was revealed to the public in May this year but with more sublte differences than its English counterpart. One of the most interesting updates to the Scottish note which many may have missed is simply magical. The De La Rue banknote designers have added a tourist locomotive steam train to the famous Glenfinnan Viaduct. Look familiar, Potter fans? Those with poor eyesight might have more trouble spotting the update than others, but there's one thing that the visually impaired will definitely notice - a 'tactile emboss' that allows users to differentiate between notes by feeling a series of raised dots. Right on! BBC Staff Writer. 18 July 2017. "New plastic £10 note featuring Jane Austen unveiled". BBC Business. Accessed 19 July 2017. Web. BBC Staff Writer. 29 May 2017. "Bank of Scotland unveils new £10 plastic note design". BBC Scotland Business. Accessed 19 July 2017. Web.